What’s More Important, the War on AIDS or Just War? JOHANNESBURG/NEW YORK, Aug 13 2014 (IPS) - They say there is a war on and its target is the deadly human immunodeficiency virus (HIV). This war runs worldwide but its main battleground is sub-Saharan Africa, where seven out of 10 HIV positive persons in the world live – 24.7 million in 2013. The region suffered up to 1.3 million AIDS-related deaths in the same year, according to the United Nations. A ragtag army is fighting the war on AIDS. Sometimes it is comprised of well-dressed aid officials sitting in conference rooms allocating funds. At other times, it deploys shabby foot soldiers – community healthcare workers and AIDS activists – into desolate rural areas with no running water, let alone antiretroviral therapy. With many competing health problems, funding for AIDS is a growing concern. Yet a look at the defence of budgets of several countries plagued by HIV portrays a startling picture of governments’ priorities, with huge military expenditures belying the argument that the key obstacle to winning the war against AIDS is money. With an HIV prevalence of three percent, Nigeria has the second largest number of people living with HIV in Africa – 3.4 million in 2012, according to UNAIDS. Government’s response to the epidemic picked up last year but is still woefully inadequate. Many people are not accessing the treatment and care services they need, or at a steep price. Out of pocket expenditure for HIV and AIDS services accounts for 14 percent of household income, according to the United Nations Children’s Fund. Nigeria has US$600 million for AIDS until 2015, with donors shelling out 75 percent. This is an improvement: government provided only seven percent of total AIDS funding in 2010, compared to 25 percent now. This year, the government is expected to allocate 373 million dollars to HIV programmes and 470 million in 2015, to meet the target of contributing half of AIDS financing needs. But it remains to be seen if this will be done. Nigeria has many competing health priorities, and the recent Ebola fever outbreak will require extra funding and urgency. Meanwhile, the proposed defence budget for 2014 awarded 830 million dollars to the Nigerian army, 440 million to its navy, and 460 million dollars to the air force. In total, the country has allocated 2.1 billion dollars to defence this year, according to the Nigerian Budget Office. This includes 32 million dollars for two offshore patrol vessels purchased from China, and 11.2 million dollars for the procurement of six Mi-35M attack helicopters, according to DefenceWeb. And, as the 2015 deadline for the United Nations Millennium Development Goals looms large – with donor countries tightening their purse strings – health experts worry about financing for HIV prevention and AIDS treatment after 2015. New funding for AIDS in low- and middle-incoming countries fell three percent from 2012 to 8.1 billion dollars in 2013, says a joint report by the Kaiser Family Foundation and the Joint United Nations Programme on HIV/AIDS (UNAIDS) released in June. Five of the 14 major donor governments – the U.S., Canada, Italy, Japan and the Netherlands – decreased AIDS spending last year. And yet, while governments claim to be too cash-strapped to fight the AIDS war, funding for other wars seems much more forthcoming. Africa will need to do more with less to manage AIDS, concludes a 2013 UNAIDS report entitled Smart Investments. In Kenya, a funding shortfall is expected soon, since the World Bank’s 115 million-dollar ‘Total War on HIV/AIDS’ project expired last month. Meanwhile, the country’s defence budget is expected to grow from 4.3 billion dollars in 2012-2014 to 5.5 billion dollars by 2018, as the country stocks up on helicopters, drones and border surveillance equipment, according to the news portal DefenceWeb. True, Kenya is under attack from Al-Shabaab terrorists. Still, five out of 10 pregnant Kenyan women living with HIV do not get ARVs to protect their babies. In Mozambique, a dearth of funding puts the country’s recent military expenditures into a harsh light. Daniel Kertesz, the World Health Organization representative in Mozambique, told IPS the country’s six-year health program has a 200 million dollar finance gap per year. Mozambique being very poor, it is difficult to see how the country – with 1.6 million infected people, the world’s eighth burden – will meet its domestic commitments. “Today, Mozambique spends between 30 and 35 dollars per person per year on health. WHO recommends a minimum of 55-60 per person per year,” Kertesz said. The same week, the government announced it had fixed eight military fighter jets, which it had discarded 15 years ago, in Romania, and is receiving three Embraer Tucano military aircraft from Brazil for free, with the understanding that purchase of three fighter jets will follow. According to a 2014 report by the Economic Intelligence Unit, Mozambique’s spending on state security is expected to rise sharply, partly owing to the acquisition, by the ministry of defence, of 24 fishing trawlers and six patrol and interceptor ships at the cost of 300 million dollars – equal to half the 2014 national health budget of 635.8 million dollars. The same week the refurbished fighter jets landed at Maputo airport, the press reported that the main hospital in Mozambique’s north-western and coal-rich Tete province went for five days without water. Indeed, the country’s public health system is in such dire straits that the United States President’s Emergency Plan for AIDS Relief (PEPFAR) meets 90 percent of the health ministry’s annual AIDS budget. 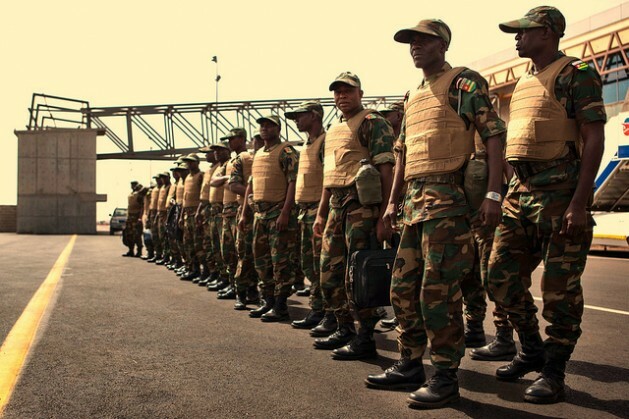 Angola spent 8.4 percent of its 69 billion dollar budget on defence and just 5.3 percent on health in 2013. In 2013, Morocco’s military expenses of 3.4 billion dwarfed its health budget of just over 1.4 billion dollars. South Sudan spent one percent of its GDP on health and 9.1 percent on military and defence in 2012. “The state budget for social programmes is not increasing at the same level as military, defence and security spending,” Jorge Matine, a researcher at Mozambique’s Centre for Public Integrity (CIP), told IPS. “We have been pushing for accountability around the acquisition of commercial and military ships for millions of dollars,” he said. A coalition of NGOs has requested the government to explain “its decision to spend that money without authorisation from Parliament when the country is experiencing severe shortages of personnel and supplies in the health sector,” Matine explained. The coalition argues that, if defence spending remained as it was in 2011, the country would save 70 million dollars, which could buy 1,400 ambulances (11 per district, when many districts have only one or two) or import 21 percent more medicines. A similar pattern unfolds across the continent where, according to the Stockholm International Peace Research Institute (SIPRI), military spending reached an estimated 44.4 billion dollars in 2013, an 8.3 percent increase from the previous year. In Angola and Algeria, high oil revenues fuel the buying spree. The South Africa-based Ceasefire Campaign reported recently that arms deals with private companies are also on the rise in Africa, with governments expected to sign deals with global defence companies totalling roughly 20 billion dollars over the next decade. At the same time, the 2001 Abuja Declaration, whose signatories committed to allocating at least 15 percent of gross domestic product to health, has “barely become a reality”, Vuyiseka Dubula, general-secretary of the South Africa-based Treatment Action Campaign, told IPS. “Regardless of our calls, very few countries have even come close to 12 percent, including some of the richer African countries such as South Africa and Nigeria,” Dubula said. Mozambique is a sad example of Abuja failure. 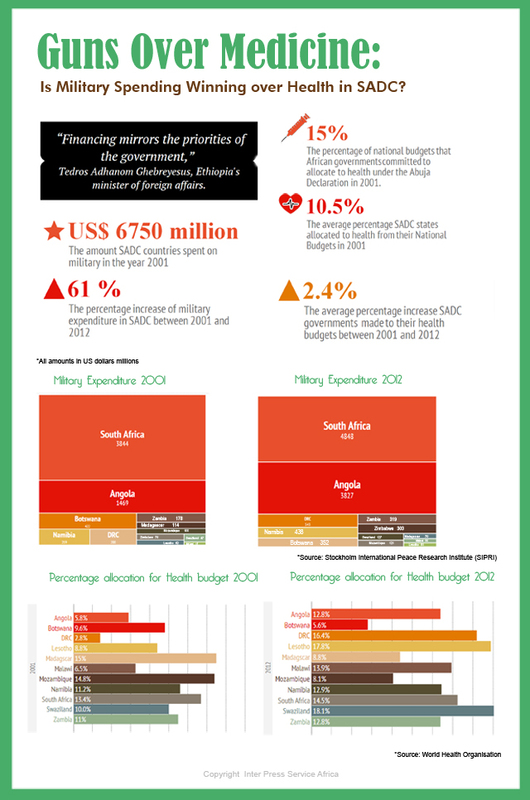 Back in 2001, Mozambique’s health budget represented 14 percent of the total state budget, tailing the Abuja target. It declined to a low of seven percent in 2011 and clawed to eight percent since. If this is true, the budgets of many African countries reflect greater interest in arms deals than in managing the deadly HIV epidemic.